Kristen started the year with some awesome motivation! I’m so excited to be doing this with her because she’s both inspiring and encouraging. I, on the other hand, have been a little slower to identify a starting point. But let me share the progress I’ve made in a few areas. #3 – I did my research and found a LCSW study app. Pocket Prep’s ASWB LCSW (Association of Social Work Boards Licensed Clinical Social Worker) Exam Prep cost a scant $25 and comes with a lot of great features. 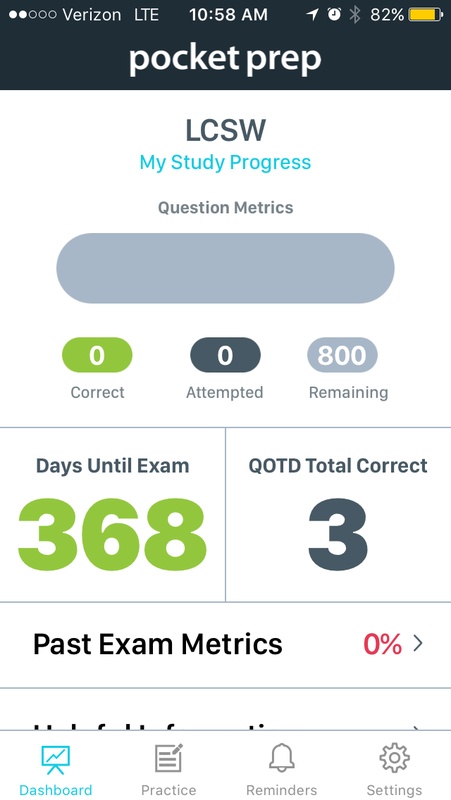 It offers Questions Of The Day, practice exams, detailed explanations for correct answers, and will track my progress. So far, I’ve gotten 3/5 QOTD correct! With a little over a year until I’m eligible to take the exam, let the studying begin! #10 – I’m on day 17 of a 21 Day Sugar Detox led by Pure Roots Nutrition. It’s been quite a challenge, but I’ve stayed on track! I had to learn meal planning, meal prepping, and tons of label reading… Overall, I do feel much better physically and mentally (but I want my sugar back)! And with the detox, I’ve tried a few new things, though I didn’t follow any recipes to the letter. I enjoyed Pulled Pork Sweet Potato Hash (added spinach and omitted cilantro) and Paleo Zuppa Toscana (subbed chicken for sausage and rutabagas for turnips). I also tried Latte Overnight Oats (minus the sugar and vanilla) but wasn’t a fan. I suppose the question is, does semi-following recipes count? Anyway, after the 21 day mark, I plan to stick with many of the sugar -free things I’ve learned (but I also plan to have a donut or two)! #12 – I’ve started reading “You’re Wearing That? : Understanding Mothers and Daughters in Conversation” by Deborah Tannen. Kristen recommended it a few years (or more) and I’m finally getting around to it. My mom and I have a pretty good relationship but we certainly struggle at times. So far, the book is pretty darn accurate and I’m looking forward to learning a few new communication tips. #46 – I bought tickets for The Book of Mormon in Richmond. My mom and I will going in a couple weeks to celebrate her birthday! #56 – I’ve planned a trip to the Outer Banks in March. My brother is shooting a short film there and has asked me to come help out. I may technically be “working,” but I’ll be gone for a week and should find plenty of time for relaxing. #80 – I posted my wedding dress on Once Wed. No interest yet, but I’ve taken the first step. Overall, it’s been a somewhat productive month and I still have a little over 31 to go! Sounds like a great start!